Francine Rivers is my favorite Christian Fiction writer. I've mentioned another book I love written by her in post Christian Fiction. The Masterpiece is another one of Francine Rivers romantic redemptive stories about how God's love and mercy can turn even the most broken into a masterpiece. Power of God is a compilation of Smith Wigglesworth's sermons on the power of the Holy Spirit. 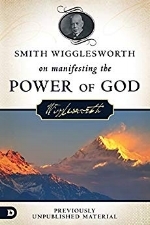 Wigglesworth was an ordinary man that walked in continuous miracle-working power of God. This is the best book I've read on moving in the Holy Spirit and seeing miracles.